Design and the Elastic Mind, an exhibit running at MoMA through May 12, is a survey of the latest developments in the field. It focuses on designers' ability to grasp momentous changes in technology, science, and social mores, changes that will demand or reflect major adjustments in human behavior, and convert them into objects and systems that people understand and use. 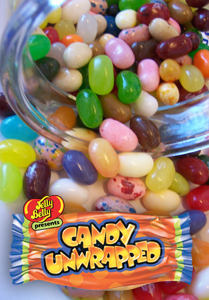 Jelly Belly has unwrapped a new traveling exhibit, Candy Unwrapped. The interactive exhibit explores the biology, chemistry, physiology and psychology of candy. It's at the Virginia Air & Space Museum in Hampton, Va., until May 4. The exhibit has planned a four-year tour in 12 cities. "I want to be a machine." The Museum of Modern Art is separating the color from the canvas in a new exhibit, Color Chart, and exploring the subversive ways some artists use (and abuse) color. The exhibit showcases 44 artists from the last 60 years, ranging from conceptual to pop, from photography to sculpture, from film to prints. The exhibition runs March 2 through May 12. Museum guards will be sporting striped silk vests by Daniel Buren and Damien Hirst is making one of his spot paintings directly on a gallery wall. 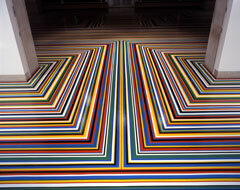 Jim Lambie is installing one of his site-specific Zobop pieces (pictured above) on the lobby floor. After Robert Smithson declared Robert Olmsted more interesting than Duchamp, he became a kind of hero of photographic conceptualism. In a new exhibit at the Metropolitan Museum of Art, Lee Friedlander walks in Olmsted's camera's-eye footsteps and photographs the same parks he did. The exhibition, “Lee Friedlander: A Ramble in Olmsted Parks,” is in conjunction with the 150th anniversary this year of the design of Central Park. 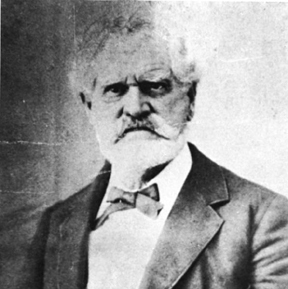 Captain Thomas P. Leathers was a famed steamboat builder and captain during the Civil War era. Confederate President Jefferson Davis asked him to head up the South's naval operations on the Mississippi River. He declined the offer but did transport troops and run supplies for the Confederacy. He built seven vessels named Natchez. A replica of his Natchez V is now on display at the Vicksburg Battlefield Museum. The model is one of about 250 other boat and ship models at the museum. The Natchez V ferried Jefferson Davis to Vicksburg from his home on a Mississippi River island after he learned he had been elected president of the Confederacy. He then continued to Montgomery, the capital city at the time, for his inauguration. Afterward, the ship moved soldiers to Memphis. The steamboats were christened in honor of the Indian tribe, not the city of Natchez. The Natchez V was followed by its more famous sister ship, the Natchez VI, which lost a famous Mississippi River race from New Orleans to St. Louis in 1870 to the Robert E. Lee. 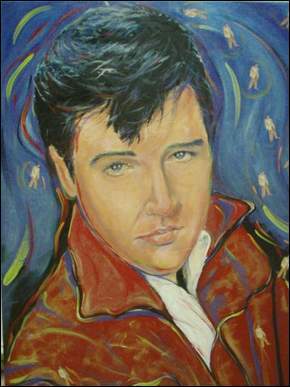 Elvis Presley is the main attraction through Feb. 24 at the Masur Museum of Art in Monroe, La. 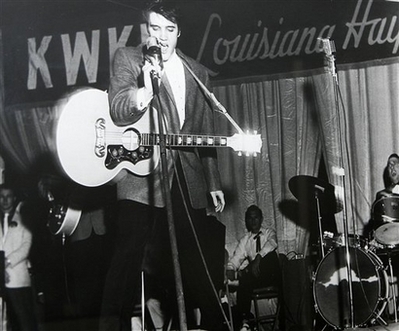 The museum is currently showing photographs of Presley's last appearance at the Louisiana Hayride - the country music show where an announced purportedly first said the now-infamous words of "Ladies and gentlemen, Elvis has left the building." Hayride was a radio show first broadcast by station KWKH out of Shreveport, La., in 1948. Horace Logan was the show's original producer and emcee. The program was broadcast from the Municipal Auditorium in downtown Shreveport and was fashioned after other “barn dance” radio programs such as the “Grand Ole Opry” out of Nashville and the “WLS Barn Dance” in Chicago. Also included in the exhibit is local artists' interpretations of the King of Rock 'n roll. Twenty seven artists such as Lissy Sanders Babb, Joy Surles, Todd Maggio, Bob and Linda Ward, Adam Davenport, Hugh Miller, Gene Hayes, Tommie Sue Sartor and Margaret Becton Buckle share their own personal versions of Elvis. The museum is decorated in blue, celebrating Presley's holiday favorite and suede shoes. The photographs are black and white and were taken by two photojournalists, the late Langston McEachern of The Times and Jack Barham of The Shreveport Journal, during the benefit on Dec. 15, 1956 (part of Col Tom Parker's $10,000 buyout of Presley's $200-a-week contract with the Hayride). Parker had already signed a $40,000 recording contract for Presley. This seldom seen collection is on loan from the Meadows Museum of Centenary College, located in Shreveport. The Hayride benefit performance came at the end of a year that began with the release of "Heartbreak Hotel." The first major traveling exhibit of George Ohr pottery will head to California and Texas first, with additional venues to be announced. The exhibit, developed by curator Anna Stanfield Harris, includes 40 works from the collection of the Ohr-O'Keefe Museum of art in Biloxi and from private collectors. It opens Dec. 8 at the American Museum of Ceramic Arts in Pamona, Calif., and will travel to San Angelo, Texas, to the Museum of Fine Art next spring. A book accompanying the traveling show, George Ohr: The Emergency of an American Master, and a new poster will be available through the Ohr-O'Keefe Museum of Art by the middle of November. An exhibition of a unique collection of artwork by Bob Dylan, including variations of previously published drawings and sketches, has opened at the Kunstsammlungen Chemnitz in Chemnitz, Germany. The exhibit will run through February of 2008. Dylan called his 170 versions of pictorial motifs The Drawn Blank Series. The exhibit consists of drawings that Dylan produced between 1989 and 1992 and published in a book. Curator Ingrid Moessinger had 332 of the works specially reprinted and painted, and Dylan then selected 170 works for display at the exhibit. It is the first museum showing of his work. 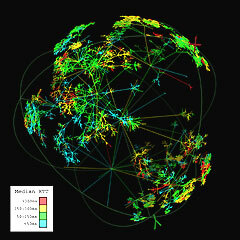 The address is Theaterplatz 1, 09111 Chemnitz, and the phone number including international code is +49 371 4884424. The Costume Institute's exhibition of the work of Paul Poiret opens May 9. Read up on the master French couturier and self-proclaimed "King of Fashion" in Style.com's picture-packed homage.